We have another food recall today: Bush Brothers & Co has announced a voluntary recall of Bush’s baked beans. 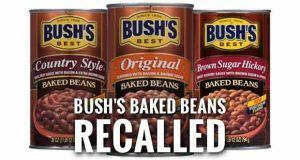 On Saturday, the company said it would be recalling all 28-oz cans of Bush’s Best Brown Sugar Hickory Baked Beans, Bush’s Country Style Beans, and Bush’s Original Baked Beans. Apparently, the threat, though, is a defective side seam on the cans. And in a time of massive listeria recalls, this one seems slightly less concerning. Internal quality assurance checks at Bush Brothers is what led to the voluntary recall; one that seems a bit on the safer side after months and months of listeria concerns throughout the food industry. The company said that this recall effects only the products listed as the issue has already been resolved. Fortunately, the company has also reported that no illness or otherwise adverse effects have been filed by consumers in connection with the products listed in this voluntary recall. Still, the company urges that customers dispose of any affected products they might possess, even if they do not appear to be spoiled. The company also noted that it is still working with its retailers in order to ensure the efficient removal of all affected products from store shelves and warehouse inventories. In the meantime, though, consumers can direct their questions and concerns to Bush’s Consumer Relations at 1.800.590.3797 Monday through Friday between the hours of 8 am and 5 pm EST. Of course, more information can also found at the company’s website: www.bushbeans.com.